I’ve yet to weigh in on the irresponsible tax cut that will reduce state revenues by $50 million over the next fiscal year because it seems almost futile to do so. But here’s the basic information. The state faces a $611 million budget shortfall. The income tax cut from 5.25 to 5 percent was triggered by revenue projections for fiscal year 2016 made back in December 2014. Those projections were rosier than they are now due in part to the oil glut that has reduced gross production tax collections here. The tax cut would be implemented in January 2016, costing the state $50 million for the remainder of the fiscal year. Once fully implemented it will cost $100 million annually. The only thing that can stop the tax cut at this point would be legislation, and that seems unlikely to pass. Democrats tried to get such a bill passed in March but it was voted down in 72-28 partisan vote. Some businesses and institutions have also tried to put pressure on lawmakers to stop the cut. 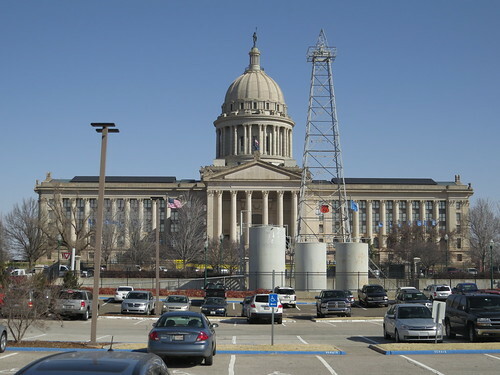 Read about the finer points of this issue here in an Oklahoma Policy Institute post. The entire tax-cut trigger concept, as I’ve argued before, is deeply flawed and disingenuous. It doesn’t allow for flexibility and is based on a forecast that could rapidly change as it did this year. It isn’t based on “real” money, only speculation. I would be opposed to any measure that would reduce state revenue right now, but if Republicans want to cut taxes they should do so upfront and make the necessary corresponding budget cuts. The fact they won’t do so shows they’re not entirely sold on the idea that tax cuts pay for themselves through additional economic activity. Isn’t that the mantra among conservatives? We’ve seen the disaster that idea has created in Kansas in recent years. The argument has been made that the $50 million isn’t really that much anyway, but anything will help given the $611 million shortfall. As usual, only the wealthiest Oklahomans will see any real benefit from the tax cut. The average cut is $31 a year, according to OK Policy. Oklahoma, it has been noted, has cut school spending the most of any state since the economic downturn that started in 2007. This is a dubious distinction on many levels. Now, its Republican-dominated legislature wants to give rich oil company executives and other wealthy people here a tax cut based on an outdated economic forecast and while the state faces a sizable budget shortfall. That’s the bottom line, and it’s just plain wrong and short-sighted.